You're Right Bert… Brazil is the Grandmaster of Football! For the past s few weeks many of us around the world have been glued to television sets watching the world's greatest international sporting event… the World Cup. There were many heavyweights entering the tournament, but by the third round many had taken an early flight home. Bert Scott of the Jamaican Ambassadors Chess Academy was one of the avid followers of the World Cup and he posted a very interesting article on his site titled, "Brazil, the Grandmasters of Football." In this article, he extols the legacy of the "beautiful game" the Brazilians are capable of displaying. Pélé must be proud. But you ask, "soccer on a chess website?" It makes perfect sense. I recently read an article that compared football (soccer) to chess and ballet. Perhaps the Brazilian side is one of the few teams that can make this analogy so apparent. 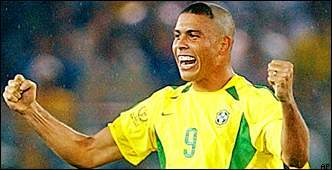 With the dangerous forwards such as Rivaldo, Ronaldo (pictured below), and Ronaldinho, this trio gave the opposition nightmares and they accounted for 15 goals, four assists and other stats that don't show in the box score. 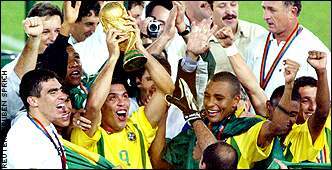 With strong defensive players such as Cafu and Roberto Carlos, they certainly brought a potent force onto the pitch. When U.S President George Bush recently asked on a trip to Brazil, "Oh… you have Blacks in Brazil too?" perhaps he got a good glimpse of the Brazilian team! The tournament moves to Germany in 2006 and the host nation will be looking for revenge. But guess what… Ronaldo will be back, and Ronaldinho is only 22… the highly-touted KaKá is only 20. Looks like another dynasty in the making. One thing's for sure the balance of power is changing in soccer as it is in most international sports (including basketball). Although Brazil is a perennial power, teams from Turkey, South Korea, Senegal and the U.S. provided a glimpse of the future. European countries are no longer a lock on soccer championships. However, men's chess will take a bit longer… that much will be evident in this year's Olympiad in Slovenia. Congratulations Brazil!! Read Bert Scott's, "Brazil, the Grandmasters of Football"